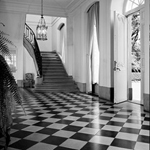 Harlequin as a black and white floor pattern is one of the oldest archetypical practices in house design, accommodating several styles and aesthetics. By the 1920s, Art Deco had influenced design becoming Harlequin a true representation of cubism and the clean straight lines in trend. Authentic Art Deco Interiors and Furniture in Full Color depicts the use of Harlequin in a variety of vibrant colors, mostly ceramic tiles, in settings as kitchens, bathrooms, and children’s rooms. All the settings show that the preference of the time was to install Harlequin in a right angle. This grid pattern was heavily influenced by the Wiener Werkstätte Stil which “stripped [pattern] . . . to its barest essentials: the pure geometry of checkerboards”.5 The Werkstätte designers applied black and white Harlequin to almost every decorative element including textiles and objects. Contemporarily, Harlequin is not relegated just to floors but it is often used as a wall design. In spite of its previous presence in the form of small glazed tiles in the walls of kitchens and bathrooms for easy cleaning, today it acquires the form of painted murals comprising entire walls or even metal meshes dividing spaces. In a 1997 Chicago residence, interior designer Olafsen-Scheiber painted a black and white Harlequin pattern over a living room wall, while in the Lotus House in Japan, Kengo and Kuma Associates wrapped an entire house in a metal Harlequin lattice making the void parts read as black and the solid ones as white. 1) Jane Fawcett, Historic Floors: Their History and Conservation (Boston: Butterworth-Heinemann, 1998),148. 2) Fawcett, Historic Floors, 146. 3) Fawcett, Historic Floors, 146. 4) Fawcett, Historic Floors, 149-50. 5) Judith Gura, The Abrams Guide to Period Styles for Interiors (New York: Harry N. Abrams Inc., 2005), 276. 6) Carleton Valley, In the Pink: Dorothy Draper, America’s Most Fabolous Decorator (New York: Pointed Leaf Press, 2006), 46. 7) Valley, In the Pink, 207. 8) Evidence for the use and the chronological sequence of Harlequin as a house archetype was developed from the following sources: 1950 Walter Prokosh House  Walter Prokosch Architect; Old Greenwich, CT; in John Hancock Callender, "Six East and West Coast Houses," Architectural Record 110, no. 5 (Nov. 1951): 130; PhotoCrd: Joseph Molitor; Vladimir Ossimpoff House  Vladimir Ossipoff, Architect; Honolulu, Hawaii; in "Residence on a Windy Hilltop in Hawaii," Architectural Record 118, no. 3 (Sep. 1955): 199; PhotoCrd: R. Wenkam; Rendering  Earl Perreault, Illinois Chapter AID in Anonymous, "AID-Decorator's Big Show," Interior Design 27, no. 3 (Mar. 1956): 112; PhotoCrd: Anonymous; Gourmet Kitchen, Private House  Mrs. Willie May Baird, Interior Design, AID of The Strassel Co., Louisville and General Electric in Anonymous, "Contemporary Kitchens," Interior Design 27, no. 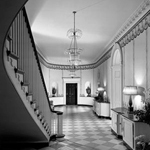 2 (Feb. 1956): 96; PhotoCrd: Anonymous; Dining Area, Edgar B. Lau House  Pancoast, Fernendino, Skeels and Burnham, Architect; James Merrick Smith Associates, Interior Design, AID; FL in Anonymous, "Triumvirate of Tastes," Interior Design 27, no. 11 (Nov. 1956): 78; PhotoCrd: Anonymous / 1970 Study, Peter and Adela Holzer Townhouse  Ruben de Saavedra; Manhattan, NYC in Anonymous, "Spanish Flair," Interior Design 48, no. 5 (May 1977): 166; PhotoCrd: Daniel Eifert / 1990 Frank McGuire and Deborah Hanley Vacation House  Perry Dean Rogers and Partners; MA in M. Gaskie, "Little House in a Meadow," Architectural Record, Record Houses 1991 (Apr. 1991): 114; PhotoCrd: Steve Rosenthal; Vacation House  Donato Savoie and Antonio Morello, Studio Morsa; Nevis Island, West Indies in Edie Cohen, "Paradise Found," Interior Design 68, no. 5 (Apr. 1997): 174; Photo.Crd: Antone Bootz / 2000 Lotus House  Kengo Kuma and Associates; Eastern Japan in Naomi Pollack, "Lotus House," Architectural Record 77, no. 4, Record Houses 2006 (Apr. 2006): 102; PhotoCrd: Edmund Sumner. 2) Mendez, Marta. “Theory Studies: Archetypical Practices of Contemporary House Design.” M.A. Thesis, Cornell University, 2008, 76-87.